Today, I opened an email from Econet titled “Econet Wireless has launched yet another revolutionary product, the Econet Connected Car.” I had just heard from people that attended the launch that it had been one of the best product launches they have ever attended. That the company was on point about what it was fixing. I wished I had attended too. I’m thinking maybe I’d have understood the big “revolution” they are introducing to car tracking. I don’t get it. I asked for for the fact sheet. Here is what i got. And this. And all the time reading those specs I was thinking, where is the “revolution” here? How is this a revolution? Have they re-thought what car tracking can be in some novel way? How is this another “EcoCash” for the car tracking industry as they claim? As far as I can see in the specs, everything this vehicle tracking service offers is standard in vehicle tracking services around the world. Local companies like TracKing have been doing this exact thing for years. We wrote about Tramigo doing something more novel & interesting locally more than 3 years ago. And even these 2 companies have other competition locally. But it’s not just vehicle tracking companies; NetOne have this too, they just don’t market it as well as they could. In fact, mobile operators around the world, and vehicle tracking companies working with mobile operators, offer this standard service already. Is it that Econet is going to pour millions into marketing this service, the ordinary car owner will want to buy it. As a consumer though, I know I’m not going to buy this. I don’t have a vehicle tracking problem. My car is with me all the time or its with someone I trust. Vehicle theft is so not a problem locally, I actually don’t know anyone who’s been a victim to it. Seriously, of the scores of people with ex-Japanese cars you know, how many have had it stolen? A bigger problem is people that smash the car and loot whatever they find inside. But I digress. As someone that once worked in the fleet department of a large organisation, I see reason for the larger organisations to consider buying this so they can manage their fleet better. Who’s driving which car, where are they, are they driving recklessly, are they stealing fuel etc… But I doubt even they are seeing any “revolution” here. Vehicle tracking in this same form has been pitched to them for years, and doesn’t look like Econet is bringing anything new to the table except a slightly lower price. And so yes the price, Econet has an opportunity to aggressively price this. At $100 for installation and $20 monthly subscriptions, it’s slight cheaper than other options. A quick comparison to TracKing’s similar service shows that after a year of use you’d have paid $340 to Econet, compared to TracKing’s $360 (12 x $30 a month). But this $40 saving will only be felt in the 11th month, as Econet is charging a $100 installation fee (then $20 subscription each month) where TracKing is not. For a country struggling with liquidity, paying less upfront is actually more attractive, so I’m not sure Econet’s pricing is better at all. If Econet could reduce that price further to, say, $2 a month, then I’d be thinking revolution. But even then, asking me to pay $50 installation fee just so I can track my car, know how much fuel it’s consuming, and when to take it for service – solutions I don’t have a problem for – is still a deal breaker. Even with their financial muscle, I don’t think Econet could afford to reduce the monthly subscriptions to a revolutionary price, or to scrap that un-revolutionary installation fee. Shareholders would likely not be amused. Stubborn economics. But Econet has access to car owners’ phone numbers, so maybe they can spam us until we sign up for this. I know I still wouldn’t but that’s just me. Even by Econet’s own standards, I still can’t see the revolution here. Maybe it’ll appear on the horizon in time. And just to be clear: No, I’m not expecting Econet to introduce a self driving car. A revolutionary step in ‘service’ doesn’t require a revolutionary advancement in technology. Just new thinking. And I’m not sure we’re thinking anew yet on this. Thanks Limbikani for the article. You seem to have a chronic negative perception of Econet lately and suffer from the PHD syndrome (Pull Him Down). Let me remind you, Facebook was not the first social networking platform but it is now the largest by user base. Apple was not the first company to launch a smart phone but they launched a more pricy one which became the most popular and highest revenue generating mobile device of all time. EcoCash was not the first mobile money platform in Zimbabwe but it is the largest in revenue and subscribers. 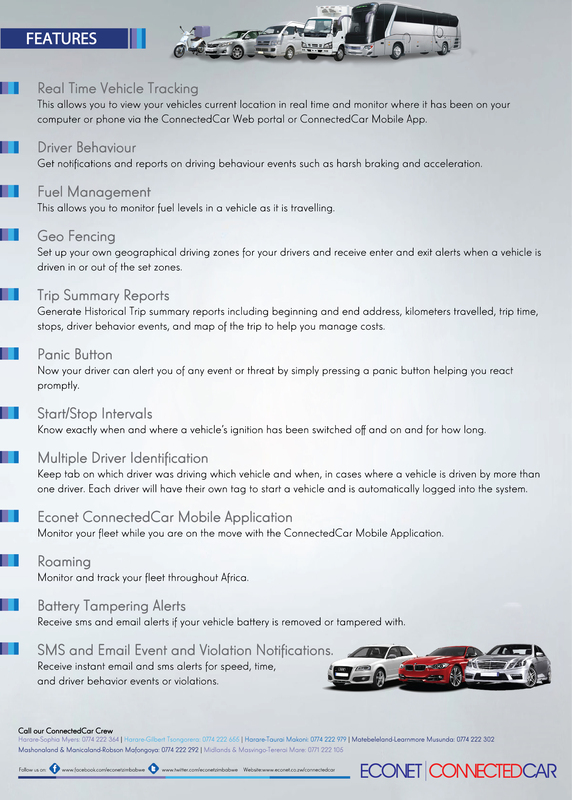 Econet ConnectedCar is not the first company offering tracking functionalities in Zim and in my view will out compete all its competitors and dominate this market and one day you will buy this device. In your commentary at times you need to think like a businessman and help readers understand the business opportunity side of such moves by companies like Econet and the impact this product will have to small businessmen and businesswomen who will benefit from being installers working with Econet. When you start reporting on your personal opinion, I am not a journalist but that seems as if you are personalising issues. It would be great if you interview people from all walks of life then you will have a balanced story. Maybe its a lesson you need to learn because such journalism brings credibility to your blog. Econet we wish you the best and thanks for giving other players and entrepreneurs an opportunity to work with you in this industry. You are helping create jobs for us in a market where people like Limbikani are not coming up with beneficial ideas. i kinda like the fact that techzim is not sucking up to econet. although here he could have touched more on how econet is basically getting into every market in zimbabwe. What I notice is that many people think its unfair for Econet to get into so many markets. I don’t agree with that view. As a company after profit, I think Econet should get into as many markets as they want and they should, for their shareholders, go after the money. I however don’t think it’s the wisest of things to do business wise – I believe that for their own good focusing is what they should do. But that’s just my humble opinion, they are a multi million dollar business and that probably suggests they know what they’re doing. so are u supporting the creation of monopolies & oligopolies (defactor monopolies in a free market economy due to over-dominance) which will in the end becoming inefficient and expensive. i think the competitions authorities need to do a better job here to prevent such. If they see opportunity where others with similar resources prefer to not do anything, let them invest in the ecosystem. It’s not Econet’s job to regulate their own expansion and try to be “fair”. This is a tech blog, what he says without citing is obviously opinion. He doesnt have to think like a business. He can think like anything he chooses to. None of these guys are journalist’s either! Disagree. This is why we have blogs, papers, tech writers. They are there to offer their own opinion on products and services. That’s how this free expression thing works. Nice rant – we can see you can type – and that you have lots of time on your hands. But this is a BLOG – personal opinions and experience are what its all about! There are free tools for you to open your own Econet praise blog if you so wish. These guys have chosen to analyse and critique – and if we always pull the “PHD” card every time pertinent questions are asked, we go nowhere! Unfortunate but can’t change how you feel about the article,. so I’m not going to try and convince you otherwise, whether in person or as @zimictfan. in my view will out compete all its competitors and dominate this market and one day you will buy this device. I have no doubt Econet will sell more vehicle tracking devices than their competitors. It’d be crazy if they didn’t outcompete them given the resources Econet has at its disposal. Resources include an existing user base. Whether Econet will sell more than the existing companies offering the same services is not what this article is about. if you didn’t see that, again, I can’t change how you read. I may indeed buy this service in future; when it’s priced right and the pain point it’s solving for me is clearer. Right now, no. In your commentary at times you need to think like a businessman and help readers understand the business opportunity side of such moves by companies like Econet and the impact this product will have to small businessmen and businesswomen who will benefit from being installers working with Econet. Again, the ecosystem opportunity is not what is under discussion in the article. Suffice to say, at current pricing, my opinion is that the opportunity may not materialize in the “revolutionary” sense your press release is pushing. When you start reporting on your personal opinion, I am not a journalist but that seems as if you are personalising issues. It would be great if you interview people from all walks of life then you will have a balanced story. Maybe its a lesson you need to learn because such journalism brings credibility to your blog. We are not journalists. We have never wished to be. In fact, you will notice that 20% is usually the facts, and 80% our opinion on the facts. Our opinions are not the “right” opinions – just our opinions. No, we’re not looking for endorsement from you or Econet on the credibility of the blog. No one’s opinions should seek anyone’s credibility endorsement. Not even your opinions should need to be endorsed for credibility. You should be free to hold an opinion and to share it. That’s what we do. they are. and it is a good thing. Just didn’t get why they say they have started a revolution. Maybe I spoke too early. Time will tell how big a revolution is upon us. Though it commendable to introduce such a service to add into the long chain of value added services that Econet has in its portfolio, I feel, like Limbikani that this service is just not necessary. Considering Zimbabwe is facing liquidity challenges, commodity price rises, low disposable incomes and the majority of the population drives low priced ex-jap cars… It doesn’t make sense for one to prioritize getting such a service. $340 is just too much compared to the derived benefit. And as rightly pointed out in the article there is rarely a problem of vehicles getting stolen here locally… And we obviously service our cars after a certain period/mileage covered. So bro I am 200% with you, I am not going to get this service…not now anyway, maybe when i own one of these —>http://t.co/bLfnSP1eOY… But then again, I would have to get a dedicated car tracking service to track such an asset. That’s where you draw the benefit of being a public company. You’re capitalised for the risk of implementing ideas that may not have an immediate benefit but has projected long term value. I agree with this article 100%, Econet is just trying to harness the power of numbers ther mutiplier is equal to their subscriber base. I have always wondered how they made thier money, There were the 1st mobile network in Zim I am a proud owner of their mobile line which I bought for $US120 and yet its real market value is US$0.5, We allowed this to happen let them do what they want with our money. Guys please i need some help, if i buy an Africom line do i still need to visit the Africom offices to connect to the internet or to get reg? This is Econet, they are just marketing the product that has been on the market for a long time now.Let hope they will succeed. Look at Eco School, it doesn’t have much textbooks save for medicine journals. A system that monitors my fuel consumption and when to take my car for service??? Cars made as early as 2000 have on-board computers that provide this and more data. And so I was thinking: if my car gets stolen, what does Econet really do? Is it a guarantee that I will recover my car? If not, with the $340, I might as well just get a comprehensive insurance cover – that amount is more than enough for any car worth $8,000. And is it fair to pay for these services??? What technology are they really using coz Apple doesn’t charge me for “Find my iPhone” service? Basically, what am I paying for here????? Lol. This is too funny. So its now obvious someone got pained by a “commentary” as he correctly put it. Easy to attack a person when nameless and faceless isn’t it? Lesson 101, it’s an opinion. People have them as do I, even harsher with more emphasis on facts than opinion. Anyways,best of luck with your “innovation”. I have no doubt money can be made with the right idea, right execution and at the right time. I share the opinion that I wouldn’t buy it if I could. Some may, but I know people are wiser with their spending in these hard times. Maybe in the next few years when the middle class comes back. Otherwise,its probably corporates and businesses who stand to gain. just tired of being harassed by faceless people. Have no issue disagreeing with people, but if someone’s going to go after the person, then they should at least have the decency to do it with a face. warwadziwa mudhara handisati ndamboona uchipindura ma comments kudai shame fani lolest! at least i managed to create some traffic for your site womborovwo cash mbijani! We are all entitled to personal opinion but poisoning the masses is no good for the nation and the future. 2. A new product means jobs created, someone employed the 2million jobs are down by one. 4. Don’t complain or give opinion about a product you have no need for. For all the men out there how cheap or expensive are sanitary pads? Would you write an article and whine about sanitary pads pricing? Give it a go. Its not about tech perspective all the time. The reason why people despise ZBC TV is not because they don’t broadcast anything but rather the quality of the content and bias towards something(hope you find it constructive here for the future of this blog and its readership). 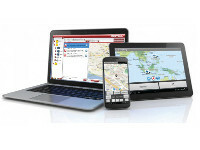 FYI fleet management and tracking is necessary for people who carry precious cargo, $20 x 100 cars is a worth saving, a mobile app to monitor your car in real time is worth the mention. How about that? 3. Yes. see specs here: http://www.cgtracking.co.zw That’s what you’re competing against. Apps are there already, so yeah, no revolution. 4. I have an Ex-Jap so assumed I was one of the 1.2 million you guys are targeting with this service. if not, then I clearly didn’t understand who’s being targeted. Great, but do you a link like this: https://play.google.com/store/apps/details?id=zw.co.econet.connectedcar&hl=en#sthash.EtvaWLFQ.dpuf ? can’t seem to find it. That is already happening Buddy. Your mobile phone is a GPS tracker. Cars have GPS, Galileo and GLONASS trackers. if you dont launch your product, someone else will do it for you. Can you identify a partner for these guys in this our Zim economic environment. Read their EcoLife story and understand why you do not just take any partner from the bush. Look how partnering with the Chinese has been bad for many Zim projects. Sometimes its worth doing it on your own. First and foremost, I agree with Soul 100%. I spoke to an econet developer who was asked to work on this project, before its launch. In fact his question to the team was, whats new about our offering? He was hush hushed and asked to work on it. Thats how Econet works. The truth is there is nothing new about the offering, and it will have very little traction and uptake. Why? Again Soul is on point. This product is not a solution because its not solving a problem at all. Second: Econet has had this product before, and it died a natural death. It has no much uptake. It was called Cellstop, and they had it in 2000. In a shrinking market like Zimbabwe, consumers and firms are focused on bread and butter issues, and some even go for long periods without servicing their cars, and this product is lowest on their list of priorities. Third: Econet made the same mistake with its solar product. Those in the know know that it failed spectacularly, and they have been giving it away at a loss to clear stocks. Forth: In a bid to appear innovative and Steve Jobs like, Mr Darlington Mandivenga is churning out product after another every three or so months. But its important to know that Jobs’ genius was in trimming Apple’s products at a time Apple was making losses to focus just on four quadrants, and dumping lossmakers. But Econet Services is taking too many loss makers to market. For example, there is no money to be made from Ecofarmer. For the uninformed, part of the reason is that Econet gets funding from other institutions for some of these initiatives. For example, Econet got some funds from the World Bank for the Ecocash product – but of course they don’t talk about it. Over 90% of the products from Econet services are actually a drain on their resources, and they don’t make much money. Even the large marketing budget will not make them saleable under the present circumstances. What I am saying above is the truth, whether folks on this forum perceive it as PhD or otherwise. Business is all about risk my friend. If you cant take risk then you can’t go anywhere. Whoever thought EcoCash will grow that big when Netone and its Onewallet was struggling? So why not take the risk no matter where the funding is coming from. Losses are part of business. A business development cycle does not start with a profit but a loss. This is ICT brains meet business. Clearly one part needs the other. The reason why most Zim start-ups fail is lack of understanding of business principles. When i read the title I immediately clicked thinking econet has done something along the lines of apple’s carplay only to find it was about vehicle tracking which i thought they were already doing. I guess they do need to find new revenue streams at the expense of sounding like a broken record, but there will be customers flocking to get this product the question now would be, if a company already has tracking, Why would they move to this product?